I've been thinking a lot about what I've learned since taking the plunge into blogging a year and a half ago. It's certainly been a learning process along the way and I'm grateful for the blog community that has been so helpful to me. 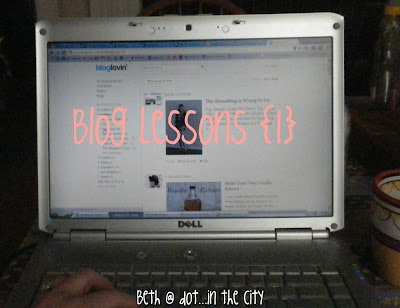 Throughout the month of March, I plan to share lessons I've learned about blogging each Thursday! Write with your own voice. It may take some practice at writing blog posts to find your voice, but you won't know until you do it. Copying someone else's style isn't sustainable...you'll wear yourself out! Consider your comfort zone, what you're familiar with and write about it. Share your stories, activities and interests. You don't need to claim expert status to talk about what you know, but write about what excites and interests you and other's will see your enthusiasm. Make it part of your daily or weekly routine. I'm not saying you have to post every.single.day. to be considered a "blogger," but it's helpful to develop a rhythm ((for both you and your audience)). For some that means weekly posts and others it means daily. This looks different for me at certain times of the year. My weeks change and I don't often get to blog each day, so I carve out time on the weekends to write posts for the week ahead and schedule them. This has becoming increasingly important during my blogging career with the development of Pinterest. If you post a photo or image you did not create on your blog, site its source! If you don't, you're claiming it as your own and that can be will likely be perceived as dishonest. Unless your blog has a very specific niche, it can be helpful to change up the type of things you write about from day to day. I like to write about a lot of different things from crafts to thankful posts to places we visit. It keeps things interesting to change it up, rather than writing about my day-to-day happenings ((I'm just not that interesting)). Thanks for these tips - as a new blogger, it's really helpful to read advice from bloggers I respect! I have definitely learned to write about what I know - it's helped me write better and more passionately, I think!